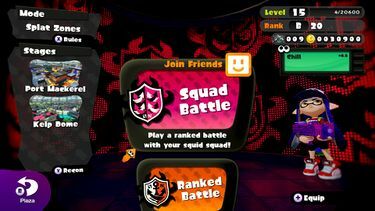 The Battle Lobby is the online mode category selection screen of Splatoon and Splatoon 2 where players can choose either Regular Battle, Ranked Battle, Private Battle, Squad Battle, or League Battle to play. In Splatoon, the player can enter Inkopolis Tower from Inkopolis Plaza or tap on "Lobby" on the GamePad map to access the Battle Lobby. In Splatoon 2, the player can enter Deca Tower from Inkopolis Square or select "Lobby" after pressing . Upon entering the tower, the player is presented with five different connection options to choose from. These options are Regular Battle, Join Friends, Ranked Battle, Squad Battle, and Private Battle. Selecting any of these options will allow players to join online or create lobbies. A sixth option, Recon, is also avalable, although it does not connect players to online lobbies. This option allows the player to join non-ranked online battles with all players around the world. These battles are for more casual play, and both the winning and losing teams get rewards at the end of each battle. Currently, the only mode in Regular Battles is Turf War, Splatoon's main mode. This option also allows players to join non-ranked battles. However, rather than joining a game with random players from around the world, it instead allows players to join any Miiverse friend who is currently playing in a Regular Battle. If the friend is joinable, upon selecting their name, the player will have to wait in a loading screen until their friend's match is over before being able to join. After the results screen is finished, and if one of the eight slots opens up in the friends lobby, the player can then join them. It should be noted that this option does not guarantee that the two friends will be put on the same team; it only allows them to play in the same lobby. This option allows for players to join ranked battles with players around the world. This mode has a ranking system that groups players of similar skill together in a battle. This mode is more competitive, as teams get significantly more Battle Points and coins upon winning a battle. The players' ranks are also negatively affected upon a loss, making winning an even bigger priority in these battles. Due to this competitiveness, players can not join their friends in this mode. There are three modes in Ranked Battles: Splat Zones, Tower Control, and Rainmaker. This option also allows for players to join ranked battles. However, rather than having eight random people from around the world join the lobby, this option instead allows any 2-4 Miiverse friends to form a team, or squad, to battle in ranked matches against another squad of 2-4 players. If a squad is comprised of only 2 players, it will be paired up with another two player squad, which will be put up against four other players. If a squad only has three players in it, it can be put in a 3v3 battle, or it can be treated as a four player squad, and will sometimes be put into a 3v4 battle. Four player squads can be put up against three or four player squads. Players' ranks will go up and down as they win and lose, until they reach either of the "S" ranks. The matches are played on either of the two stages in the rotation, and with the mode currently in the rotation for normal Ranked Battles. Unlike the previous three connection options, players can change their weapons and gear before matches, and can leave the lobby at any time. This option allows for players to create a custom lobby that Miiverse friends can join. The host of the lobby can change several different factors of the match, including which mode will be played and which stage will be played on. The host can also decide which players can go on each team. The team match-ups can range from 1v1 to 1v4 to 4v4. Players' ranks and levels will not be affected in these private battles. However, like Squad Battles, players can change their weapons and gear before the match, and any player can disconnect from the lobby at any time. This option, accessible by pressing while in the Battle Lobby, allows the player to freely explore any of the stages currently in the rotation for both Regular Battles and Ranked Battles before going into an online lobby. This mode is useful for finding vantage points on a map, or getting used to a new map in the stage rotation. If the player does recon on any stages currently in the rotation for Ranked Battles, the tower or splat zone(s) will also be on the map, depending on which mode is currently being played in Ranked Battles. Lobbies are the areas where players wait for battles to begin. Once a player joins a lobby after selecting on any of the five options listed above, they cannot leave or change their weapon or gear unless it is a Private Battle. A countdown in the upper-left corner of the screen. If this countdown reaches zero before eight players have joined the lobby, everyone in the lobby will be disconnected. While waiting for the battle to start, as well as while waiting to join a lobby, the player can play a minigame on the Wii U GamePad by pressing plus. Squid Jump is the only minigame available from the start, but more minigames can be unlocked by playing through amiibo challenges. Once eight players have joined the lobby, the screen will display "BATTLE TIME!" in the North American version of the game, and "Let Battle Commence!" in the European version. Then the minigame will pause and the battle will start. After the battle has finished, and Judd has determined which team has won, each player is taken to a results screen, which shows how many kills and deaths each player had, and how many Battle Points each player earned. After this, the player's Rank (Ranked Battle only) and Level may change depending on performance, and the player is given the option to either play another round in the same lobby, or disconnect from the lobby. If the player chooses to disconnect, they are taken back to the Battle Lobby. If a player's internet connection is not good enough to stay in the lobby/battle, they will be disconnected from the lobby. This is also called a Communications Error. 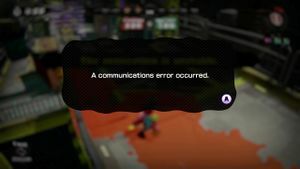 If this occurs before the battle starts, the player will simply receive a message that states that "A communications error occurred", and they will be disconnected from the lobby. If this happens during or directly after a battle before the results screen, a message will come up saying the same thing, and the player will again be disconnected. On the results screen, it will show that the disconnected player had zero kills and deaths, and in Regular Battles, it will show that they inked zero turf (unless their team won, in which case it will show that they earned 1000p). In both instances, the disconnected player will return to the Battle Lobby. 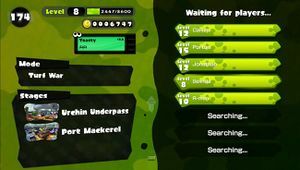 During Splatfest, the lobbies are a bit different than normal. Upon first entering Inkopolis Tower, the player is not given the five normal connection options. 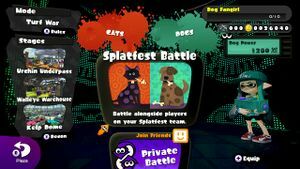 Rather, the only options in the Battle Lobby are to create a Private Battle, or to join a Splatfest Battle. Upon joining a Splatfest lobby, one can notice other differences in the online lobbies as well. Rather than having eight player slots on the right of the screen all in a row, the eight slots are divided into two groups of four slots. These two groups represent the players that will be battling for both Splatfest teams. Once all the players of one team have joined, the screen will say that that team is ready. Once the other team joins, the game will say that they are ready, and then the battle will start. Several different counters and meters are displayed on the lobby. The level meter indicates how "fresh" a player is. This is a general indicator of that player's play time, but is necessary for things like being granted access to shops or Ranked Battle. The vibe meter shows how well a player is doing in the current game session. It is measured using flags, with every victory scoring one extra flag, but every loss decreasing the number of flags by a variable amount. A player's vibe determines the amount of Cash they will get from Judd when they talk to him. The rank meter shows what rank the player is at, and how close or far they are to going up or down a rank. Ideally, players in Ranked Battle get paired up with players with similar ranks. During Splatfest, players have a meter that starts them off at the lowest classification, and as they battle more, it goes up. A player's classification determines how many Super Sea Snails they will get at the end of the event. The Cash counter shows how much Cash the player currently has. A Super Sea Snail counter. The Super Sea Snail counter shows how many Super Sea Snails the player currently has. It only appears once the player collects their first Super Sea Snail. Using up all the snails will not remove the counter. 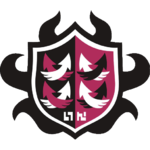 On 5 August 2015, version 2.0.0 was released. This update added numerous different matchmaking features, including Squad Battles and Private Battles. During the player being in the Battle Lobby, If the player presses the Home Screen button, and opens Friends List, it will cause to have a Communication error when the player comes back to the game, being sent back to Inkopolis Plaza and have to connect to the interent once again when the player comes back to the Battle Lobby. This page was last edited on 21 February 2019, at 15:21.